“Life” delivered pretty much exactly what I expected. It’s a solid B-science fiction-horror-movie with a good cast and a couple of visually stunning scenes, but ultimately, it’s nothing special. Like most films of the genre, it owes a lot to “Alien” – but also seemed to be heavily influenced by “Gravity”. This is especially true for the long scene at the beginning which appears to be one continuous shot, capturing the action with a seemingly floating camera. Since I’m a sucker for scenes like that, I loved this long take, and thought that it was the highlight of the movie. Unfortunately, nothing that came afterwards lived up that promising beginning, and overall, I felt that the movie pretty much went continuously downhill with each passing minute. “Life” doesn’t even try to hide which characters it thinks are more and which are less important. The former get far more attention, screen time, and at least a basic background that should enable audiences to feel some sort of connection with them. The latter are hardly sketched out and, thus, are the first to die a slow and painful death at the hands of “Calvin”. Granted, the first death came as a little bit of a surprise, but afterwards, if was rather predictable, and in the end, the only real question left was if one or two of them would survive, or if they’d all die. During the middle part of the movie, though, there wasn’t really a lot of tension, since you only waited for the less important characters to bite the stardust. Also, once again, there characters don’t always act in the most intelligent way, and some of them really seem to see this as some sort of application video for the Prometheus. Their final plan, even though I get that it was an act of desperation, seemed especially badly thought out. And there also is the occasional bit where either the astronauts or the monster depend on coincidence, otherwise the movie would have been over way sooner. And the ending as well as their choice of credits song had me roll my eyes. 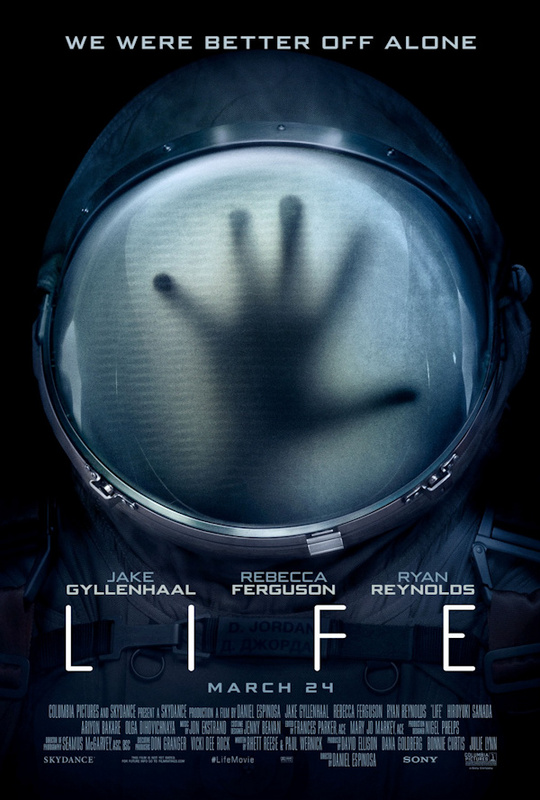 But even though “Life” is not especially innovative or surprising, it mostly manages to entertain. This is mostly due to the nice cast, who do their best with the little to nothing that they’re given. Daniel Espinosa’s direction is also solid, even though it lacks tension, and he never again reaches the high of the aforementioned awesome one-take-scene in the beginning. The sets are nice and seem convincing, and the effects – especially the ISS – are top-notch. And the monster was nice, and didn’t seem like something that we’ve already seen a zillion times. Granted, it won’t win any prices for originality, and the predictable finale hurts it considerably. But as long as you don’t expect too much, and bring a certain affection for the genre, you should find some life in this solid, run-of-the-mill B-SF-horror-movie. This entry was posted in cinema 2017, movie reviews, new releases and tagged 2017, cinema, Daniel Espinosa, horror, Jake Gyllenhaal, life, Rebecca Ferguson, Ryan Reynolds, science fiction, USA. Bookmark the permalink. A lot of fun with this. Nice review.